Framed for a stranger's near-fatal overdose at a party, blackmailed into finding a mysterious flash drive everyone in school seems anxious to suppress, and pressured by his shady best friend to throw an upcoming game, high school soccer player Charlie Dixon spends a frantic week trying to clear his name, win back the girl of his dreams, and escape a past that may be responsible for all his current problems. Whoever coined the phrase "girl next door," intending it to mean sweet or innocent, never met Bridget. We used to be tight, but she hadn't given me the time of day in years. Her sudden affection made me suspicious. Just like her emerald eyes, it was too good to be true. You can always spot a fake because it has no imperfections. I lived in the Mojave Desert. I was dehydrated. I was drying out more more and more each day, and quenching my thirst with salt water. "I've asked Charle to comply with a quick search. Several students have come to me with rumors that he's carrying a switchblade." "A switchblade, really?" I said incredulously. "Is it for the rumble this weekend? Why not a broadsword or nunchucks?" I don't read many novels from a male's perspective. There's no big reason as to why, I just gravitate more toward a female narrator than a male. But when I read the synopsis for High & Dry though I knew I couldn't pass it up - male narrator or no. Sarah brings us immediately into the story. Ellie broke up with Charlie just a few days ago and he is determined to find out why. After showing up drunk to a party, and being kicked out of said party, Charlie wakes up the next day to find out that somebody used his car to drop a fellow student off at the hospital and driving off. Big problem here is that this student had overdosed on LSD. On top of finding out who framed him and why Ellie abruptly broke up with him, Charlie is helping his neighbor/ex-girlfrind Bridget find a flash drive and understand why his friend Ryder is asking him to throw a big match against a rival school. I am a big fan of Charlie. He is a strong character with an equally strong voice. He is definitely a smart individual and is able to figure things out quickly, but at the same time he isn't Sherlock Holmes. This mixture gave him and the story a realistic feel. What I don't like about Charlie is his relationship with Ellie. He treats Ellie as if she is his end all be all. He already feels as if she is too good for him, but I feel like he is obsessive about getting her back. It's one thing to want to know why, it's another to be in the mind set that everything will work out all sunshine and puppy dogs. Part of me gets it because they're in high school and I've seen high school relationships of this variety, but jaded 27-year-old me was over it from the beginning. 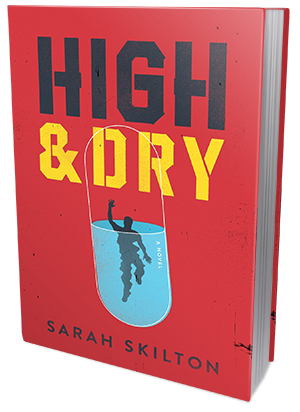 High & Dry is a cleverly written realistic mystery with a strong male POV. It's a quick read that will be great for any kid in high school that loves to read and even for those who are a bit more reluctant to read. It's fast paced and Sarah keeps her readers engaged and guessing until the very end.